So, as I set out on my travels, it wasn’t storming. I’m a poster child for not being stupid, and staying safe in storms. I was driving down the road, and it was as if the heavens opened up, and explosions of thunder and rain poured down. It was really bad for a few moments. What I came to realize, though, is that I was about to drive into a situation I really did not like. Standing water on the highway. As quickly as it came, and as unavoidable as it was, I hit that water and be began hydroplaning. That was scary, as there was literally no control. None. My car, floating on its own, was heading directly to the wall that would separate someone from plunging over it into the eastbound traffic. I just said, “God, help.” It was as if the red sea parted. Suddenly, behind and in front of me were clear of all traffic. They were there, but not in the immediate vicinity of my now out of control floating car. At this point, my car made a right turn, and started to almost spin. It veered my car towards the center lanes, and I drifted over two lanes of what should be pretty full traffic. But there were no cars within collision distance. As my car is about to spin completely around, it was rectified, and put back on a forward motion path. I hit nothing, and nothing hit me. I was safe, and on my way – traveling slowly and attempting to see through the monsoon like downpour. My car was safe, and inside it – I was too. No matter whether you believe in sheer coincidence, or angels, or the hand of God – I know that something bigger than me was in control, and protected me from the elements, the concrete wall, any other drivers, or any other peril in that moment. 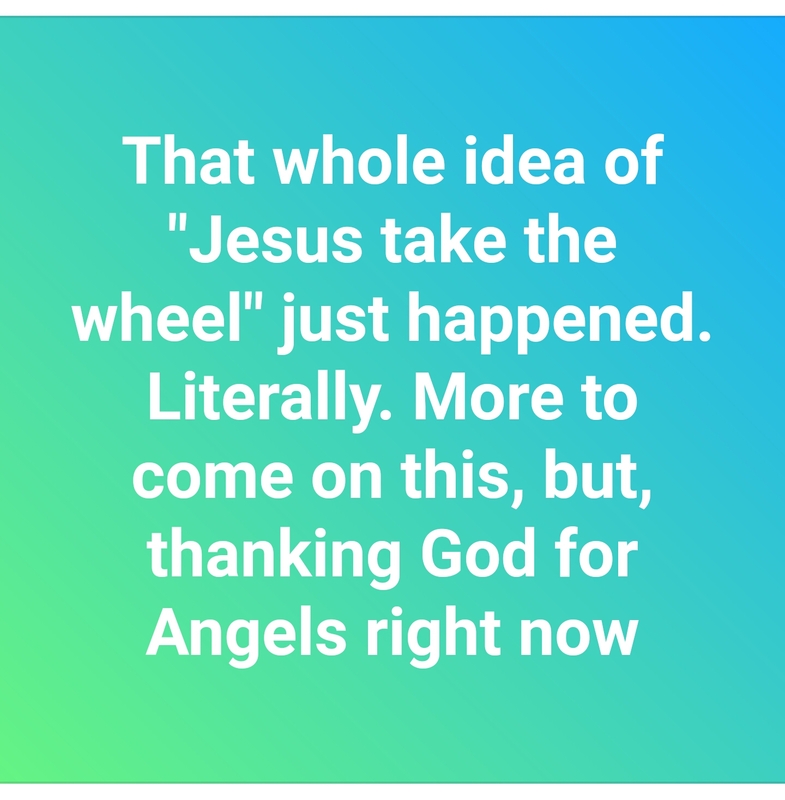 That whole concept of “Jesus take the wheel” – it happened. Yeah, it was undeniably not me. Still kinda shaking my head. God listens and hears our cries. At least that’s what my faith wants to believe.